A Game Changer for Airtight Construction? It’s rare for one innovation to transform a whole industry. But a new air-sealing technology called AeroBarrier may be poised to do exactly that for energy-efficient homebuilding in the United States. 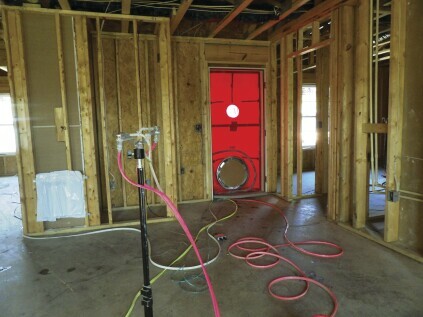 In a time when production builders are struggling to make their houses airtight enough to meet the 3 or 5 ACH50 requirement in the latest energy codes, Aero­Barrier, a simple system that blows a fog of caulk into the house while a blower door puts the building under pressure, has demonstrated the ability to bring a building from 15 air changes an hour down to less than one—in just a few hours, with consistent results, and at a consistent and predictable cost. 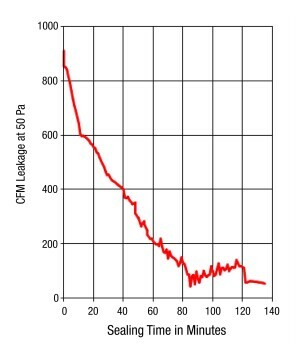 For the most advanced builders, this puts the 0.6 ACH50 Passive House standard within easy reach. For mass-market production builders, it makes meeting (or beating) code a no-brainer. And for the remodeling industry, it means that even if an existing house is fully drywalled and finished, airtightness to rival the performance of well-built new homes is within reach, without the cost of demolition or reconstruction. Automated air-sealing. The concept of aerosol air-sealing isn’t new. Weatherizing contractors in the U.S. are already familiar with a duct-sealing technology called AeroSeal, marketed by the same company that developed AeroBarrier. AeroSeal works by injecting a fog of adhesive caulking into the duct system as you pressurize the ductwork using a Duct Blaster fan. As air pressure pushes the aerosolized sealant out through cracks and gaps in the ductwork, the goo coagulates at the leak points and seals the holes. AeroBarrier, introduced to market at the International Builders’ Show in Orlando, Fla., in January of this year, applies the same one-shot air-sealing concept to an entire building. Mandalay Homes, a production builder based in Prescott, Ariz., volunteered a year ago to be AeroBarrier’s guinea pig, testing the system out on dozens of houses. According to Geoff Ferrell, chief technology officer for Mandalay, his crew has been able to reliably bring houses down to 0.3 ACH50, time after time. “When you pressurize the house to 100 pascals with the blower door, the house leaks,” Ferrell explained. “Everywhere it’s leaking, air is escaping. And once you aerosolize the AeroBarrier product into that shell, that product is leaking along with the air. The rig keeps the inside of the house warmer and more humid than it is outside, and when the fog hits that temperature and humidity differential, the product starts to gel, and it slowly builds up on itself. “So if you have a crack between two 2x4s, or in a corner, you’ll see the product build up on itself until it seals that leak, and it stops leaking—completely. At all those little spots you don’t even know are leaking, that product is collecting and sealing it off.” According to AeroBarrier, the process works on holes and gaps as wide as a half inch. While a blower door pressurizes the house, emitter nozzles pump a fog of acrylic sealant into the building air. 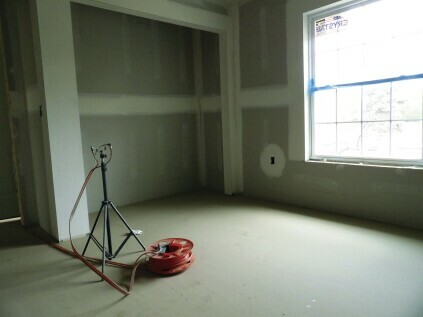 Walls can be exposed sheathing or finished with drywall. Either way, the aerosolized sealant flows out through any air leaks and coagulates on small openings as it encounters a reduction in temperature and humidity. AeroBarrier’s operating software lets technicians follow progress in real time as the home gets tighter, and also lets them stop the job as soon as the home reaches the builder’s airtightness target. A printout documents the results. Townhouses and retrofits. JLC spoke by phone in February with AeroBarrier’s manager of business development, Paul Springer, who was demonstrating AeroBarrier on site at a multifamily project for a production builder in Maryland. In this townhouse, Springer explained, drywall was already up—because that was the most practical way to button up the party walls between units. “Sealing those party walls is the hardest part for multifamily builders,” said Springer.